this past thursday i headed out bright and early to an estate sale. it was the last day of the sale and no photos had been posted online so i had no idea what i was going to find. but, the estate sale gods did not disappoint! i spotted this amazing china and it was love at first sight. then i saw the price tag of $35 dollars, quickly calculated the last day half price discount and i knew it would be a lasting love. i took home 38 pieces for $17.50. pretty good deal in my book. especially after a quick internet search, i discovered the lidded sugar bowl alone is going for $24. the pattern is "golden glory" by harmony house which i believe was sold through sears in the 50's, but i can't find any more information than that. any way, I LOVE the artwork - the gilded stylistic floral pattern is soooo anthropologie. owl you doin' today? this mini owl card and envelope is my newest make-it, also featured on the may arts blog. the template for the owl is a stamp i inked onto a piece of canvas to use as a template for my embroidery. thanks for the inspiration jenni! 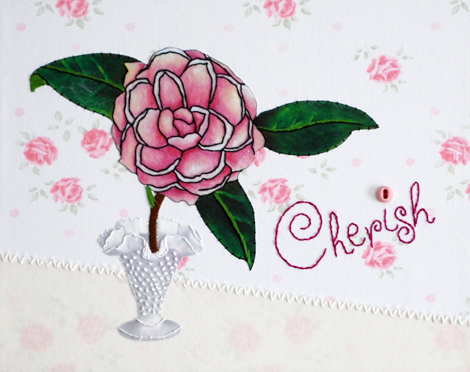 click here to download the card/envelope instructions and don't forget to check out my make-it page for more tutorials. this piece had been lying around my studio for months and i just recently finished it. i currently have a love affair with vintage pics - they are inherently anonymous, but somehow, deeply personal. have you checked out the we love french knots website yet? if you like fabric and stitching, you will definitely find some eye candy. bari j. has been highlighting various embroidery pattern designers and they are all so varied in their designs. this got me thinking about my own work and how my botanical drawings would translate to thread. this image is a scan of my first attempt to bring my drawings to life on fabric and i think it turned out rather lovely. i used a vintage sheet as the background to bring in some more interest and detail, then went to town sewing. it came together really quickly and i think because i outline all my flowers in black ink, that they could translated to this medium very well. what are your thoughts? would you be interested in seeing me offer downloadable pdf patterns in my shop? inspiration struck this weekend and i created this fabric wrapped, embroidered canvas picture frame. the photo is a sweet black and white pic of my brother when he was a toddler playing in a field of flowers. i loved embroidering flowers on top of the real flowers and bringing them to life. to finish, i added some color with watercolor pencils and a 3-dimensional fabric flower. now my obsession is taking over and i am scouring family photos to find more captured moments! i love, love, love using the vintage hankies as a background for my embroidery. you also get great discoloration in the fabric since they are so old. tea-staining can't touch what nature does on its own! the sun has popped out of the sky today, but for the past week, it has been unseasonably cold and rainy. it has been the perfect weather for some embroidery, a blanket and a movie. due to my estate sale habit, i have an overflowing bin of vintage hankies that i absolutely cannot pass up. they are the perfect size for my small wooden and metal embroidery hoops and i love making little pieces of art with them. how cool is the above oval hoop??? it is very old and uses a tiny spring as its tightening mechanism. truth be told, it took me more than a few minutes to figure out how to work it! i am working on a batch of 10 of these sweet vignettes and will have them in the shop soon. i wonder if square embroidery hoops were ever made - has anyone ever found one? i am hooked and obsessively searching every thrift store in town for more miniature embroidery hoops! seriously guys, this project is so fun and quick, but gives you huge satisfaction. i'll whip up a tutorial sometime in the next few months, but really, grab a vintage hanky, a hoop and some embroidery floss and go crazy. for the hoop above, i stamped "remember the little moments" around the edge and love the sweetness of how it all turned out. i didn't get a good side shot of this hoop, but i finished off the outside with some thin grey and red ribbon attached with alene's tacky glue. if you are wondering how i embroider text onto my pieces, i will let you in on the secret - a disappearing ink pen found in the sewing section of your local craft store. they are fantastic! you can doodle on your fabric as much as you want til you get it right, then stitch on the lines you like. then, give it a little time and all your doodle lines will eventually disappear. vintage hankies have always been a weakness of mine - i think i inherited the obsession from my mom! you can generally find hankies at estate sales or thrift stores for a buck a piece and they have the sweetest floral prints on them. my friend jenni showed up the other day and gifted me eight 4-inch embroider hoops and i knew immediately what i would do with them. hankies are typically very thin fabric, so i layered them on top of some white muslin i had in my fabric bin for extra stability and then stretched them in the hoops. my next step will be to embroider embellishments onto the flowers and maybe add a word or two to each. in my head, i can already see how sweet they are going to be! what is your thrifting weakness? and do you reuse your finds, or put the in a drawer for safe keeping? the background floral is a vintage sheet wrapped onto a 14x11 canvas frame and is already very cherished by yours truly. i think this is the true test of whether or not you are on the right track with your creative life. the more you dread selling a piece is directly proportionate to the fact that you have finally found that one thing that has been in you all along. a big thanks to everyone who has cheered me on with this new endeavor. your words of encouragement are exactly what i need.